Will you come face-to-face with St Nick himself as you enter his Den on this 1968 haunted house dark ride? 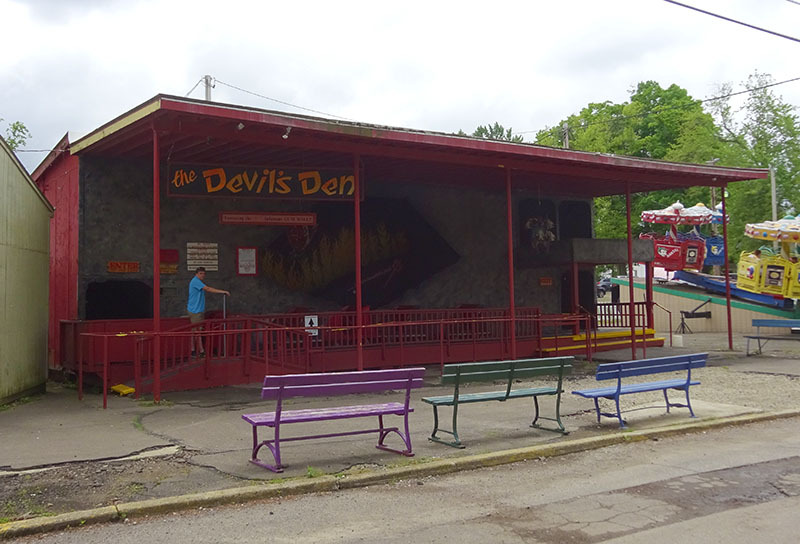 Devil's Den is a haunted house featuring the typical array of gruesome figures inside, and was installed at Conneaut Lake Park in 1968. The ride system was built by the Pretzel Amusement Ride Company, and features a chain lift hill, drop, and wooden wild mouse style track. It is one of those rides which causes endless debates in the rollercoaster community - is this a rollercoaster or not? Between 1993 and 2001, the ride was known as Dr Moriarty's Wild Ride. Although the ride's exterior was modified, inside it remained the same. In 2001 the ride was restored by a group of volunteers, who even found the original Devil's Den ride sign hidden behind a trap door underneath the ride building. The ride is very much a classic haunted house attraction, and gives an entertaining ride. The drop is good fun, and the car picks up quite a bit of speed as it navigates the tight turns inside. It is one of only two known examples of the ride manufactured by Pretzel: the other is Hawnted House at Camden Park in West Virginia.